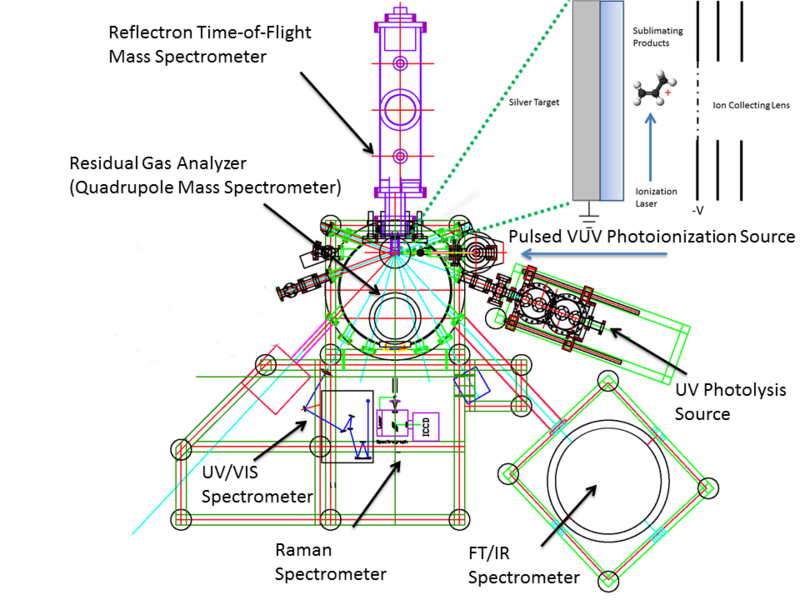 The overarching goal of this project is to explore experimentally in an innovative ultra-high vacuum space simulation chamber the formation of six key classes of complex organic molecules (COMs) – organic molecules containing atoms of carbon, hydrogen, oxygen, and nitrogen - upon interaction of ionizing radiation in the form of Lyman α photons with interstellar ice analog samples and to constrain the level of molecular complexity that can ultimately be synthesized in the interstellar medium (ISM). These key classes are aldehydes (HCOR), ketones (RCOR’), carboxylic acids (RCOOH), esters (RCOOR’), amides (RCONH2), and isocyanates (RNCO). Those objectives are achieved by systematically replicating the conditions of ice-coated interstellar grains in a next-generation ultra-high vacuum surface scattering machine through the exposure of interstellar ice analog samples resembling ices in cold molecular clouds as well as in low- and high-mass star forming regions at astrophysically relevant temperatures (10 K to 50 K) to ionizing radiation in form of Lyman α photons (10.2 eV). Compared to previous studies, we follow a radically different approach and apply a transformative methodology by probing the synthesis of COMs on line and in situ via complementary detection schemes in the condensed phase (Infrared, Raman, UVVIS) and upon sublimation of COMs into the gas phase via the progressive technology of tunable, fragment-free vacuum ultraviolet (VUV) photoionization. 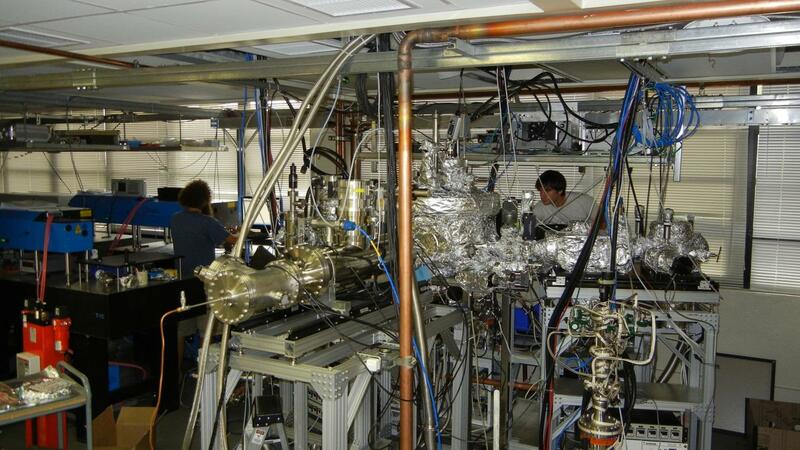 This unique space simulation chamber allows the extraction of transformative concepts on the synthesis of COMs in interstellar ices upon exposure to ionizing radiation by exploiting a novel technology through the implementation of cutting edge photoionization techniques. Key classes of COMs detected in the ISM suggested to be formed on ice-coated interstellar grains. 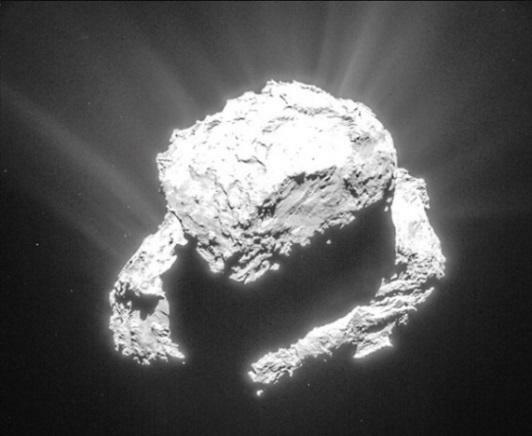 Molecules in bold were also detected in comet 67P/Churyumov–Gerasimenko. 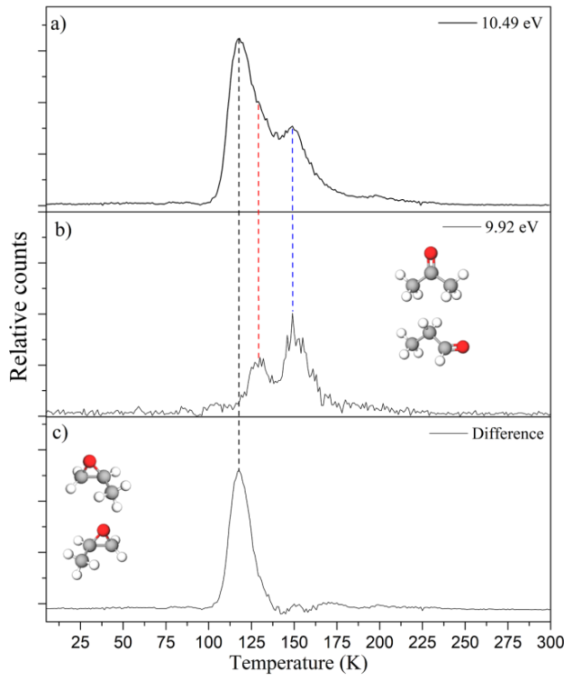 Critical effect of non-equilibrium chemical reactions on the formation of complex organic molecules within interstellar ices. Solely gas phase reactions cannot reproduce the observed fractional abundances. The astrochemical models were carried out by the group of Prof. Eric Herbst (University of Virginia). The unraveling of the formation of key classes of COMs is of core significance to the laboratory astrophysics and astronomy communities. First, our project advances the knowledge of the most fundamental processes leading to COMs on ice-coated interstellar grains in cold molecular clouds and in star forming regions. 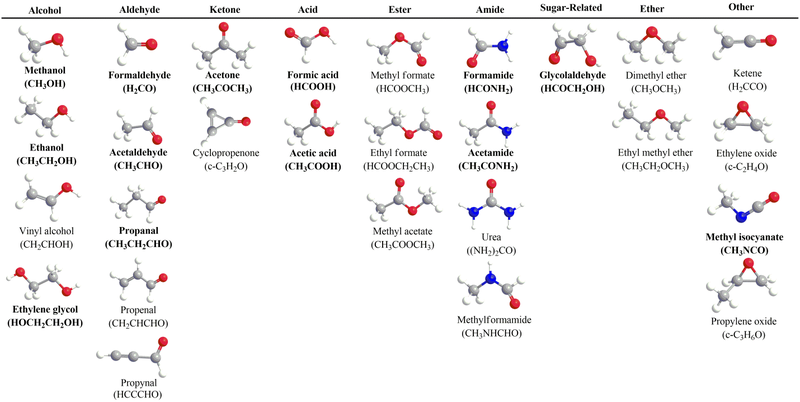 Since the transition from a molecular cloud to star forming regions depends on the molecular composition, it is imperative to unravel the processes of how COMs are formed in those environments; this also assists testing chemical models of molecular clouds and of star forming regions as these molecules may play a key role in astrobiology and their synthetic pathways are constrained by physical (temperature, radiation) and chemical (ice composition) conditions. 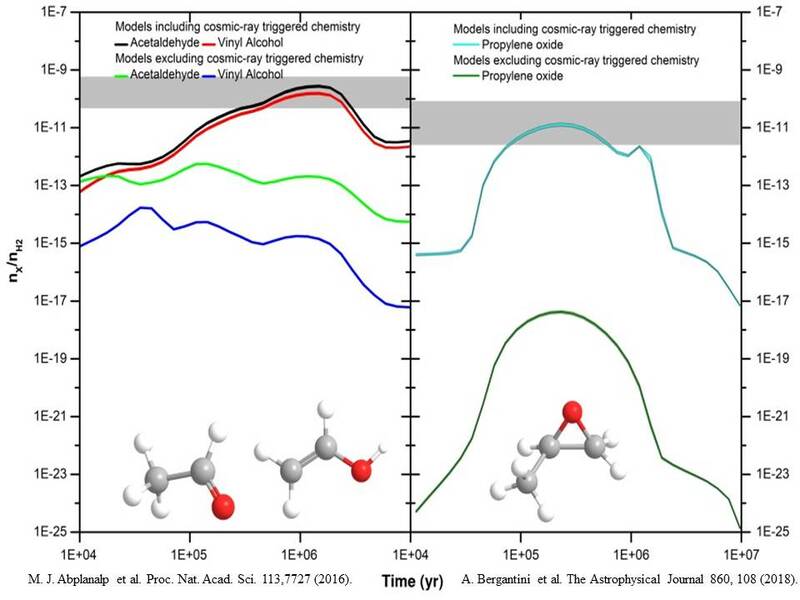 Second, structural isomers – molecules with the same molecular formula but different connectivities of atoms – serve as a molecular ‘clock’ and ‘tracers’ in defining the evolutionary stage of cold molecular clouds and star forming regions. Here, the lack of data on products and rates of their formation and how they depend on the ice temperature and composition limits the understanding of how COMs are synthesized. In combination with astrochemical modeling, our project extracts transformative concepts on the formation of COMs on interstellar grains and defines an inventory of COMs constraining the level of molecular complexity that can ultimately be synthesized in space. 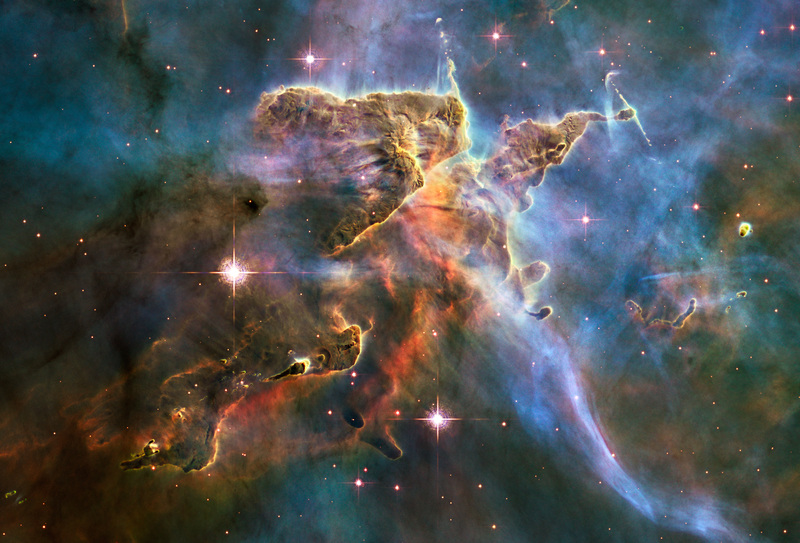 Also, if a new COM is detected in the ISM, the agile management of our project allows a rapid implementation of fresh laboratory experiments and astrochemical modeling to unravel not only the underlying formation routes of this COM, but also its role in the astrochemical evolution of molecular clouds and star forming regions. Third, since COMs have also been identified in the Murchison meteorite and in comet 67P/Churyumov-Gerasimenko, our project might bring us closer to understanding the extent to which these key classes of COMs might have been synthesized exogenously in the ISM, (partly) incorporated into comets and parent bodies of, e.g., Murchison, and then delivered to early Earth. Left: Benefits of fragment free single photon ionization. a): electron impact ionization (70 eV) fragmentation pattern of methyl formate (HCOOCH3). Note extensive fragmentation of the parent peak at m/z = 60 following electron impact; b) single photon fragment free ionization (10.9 eV) resulting in an intense molecular ion. 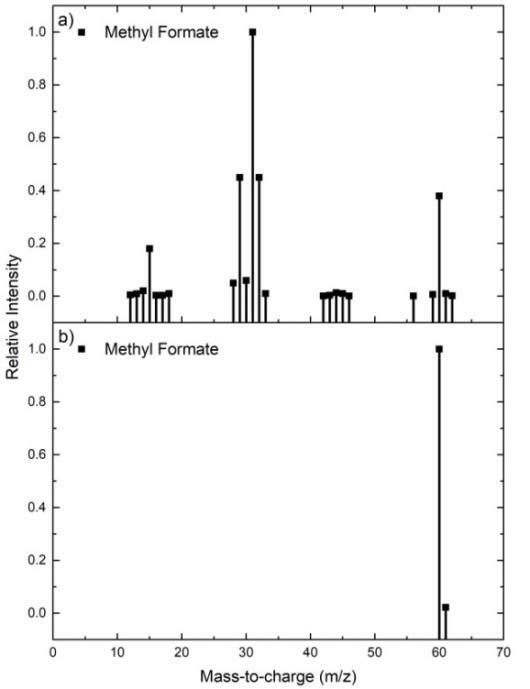 Right: Sublimation profile of the molecular ion C3H6O+ (m/z = 58) after photoionization of the subliming molecules with 10.49 eV (a) and 9.92 eV (b) in irradiated carbon dioxide – propylene ices; the fits of the 9.92 eV experiment were subtracted from the 10.49 eV experiment (c); the result corresponds to signal from propylene oxide (c-C3H6O) (c). At a photon energy of 10.49 eV, all C3H6O isomers are ionized; at 9.92 eV, C3H6O isomers except propylene oxide are ionized. Top view of the main chamber including the cryogenic target (point of converging lines), analytical instruments, and photolysis source. The source is aligned with respect to the target to allow for the simultaneous in situ monitoring of IR, Ra, and UV-VIS spectroscopies. The inset shows the geometry of the ReTOF lenses with respect to the target and ionization laser.